­­­­­Photron, Inc., (www.photron.com) a global leader and manufacturer of high-speed digital cameras and software for slow motion analysis, launches a new website featuring high speed imaging cameras, systems, and applications, plus an extensive gallery of high-speed footage captured from Photron’s cameras and slow-motion systems. Photron’s entire line of high speed imagers are presented in three sections: High performance FASTCAM SA Series; Lightweight and Multi-head, Remote Head Models; and Powerful, Compact FASTCAM Mini Series. To view these ultra-high performance, high-speed camera systems, go to http://photron.com/cameras/. 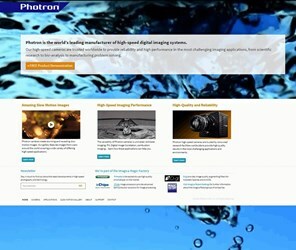 The new applications section at http://photron.com/uses/ features high-speed imaging tech notes on shadowgraphy, laser illumination, Schlieren imaging, particle imaging velocimetry (PIV), and combustion studies. Photron’s new website also features a wide variety of software for camera control, data acquisition (DAQ), and motion analysis. To view, please go here: http://photron.com/product-category/software/. For more information about Photron’s family of products for imaging extremely high-speed events, using the most light-sensitive high speed imagers for slow motion analysis, please call +1 858-684-3555. Photron, Inc. (USA) (www.photron.com - San Diego, CA) is a leading worldwide manufacturer and supplier of digital high-speed cameras, including the world’s fastest megapixel video systems. High-speed imaging products range from low-cost solutions to highly specialized, intensified systems for biofluorescence and combustion analysis. High- speed, slow-motion cameras featuring high definition (HD) resolution up to 2,000 frames per second are available for motion picture, reality TV, sports, and broadcast applications. For production fault-finding, Photron offers high-speed imaging systems with multiple miniature cube or pencil camera heads. For extreme or hostile environments, such as vehicle crash testing and/or military weapons proving, Photron’s high-G rated camera systems are utilized. Cameras include standard and custom, high-resolution, high-speed imagers, software, and systems to meet R&D, automotive, commercial, medical, and defense-related motion image analysis requirements.